What would you think about turning your smartphone into a scanner? Sydney-based eora 3D is looking to make that quite possible. 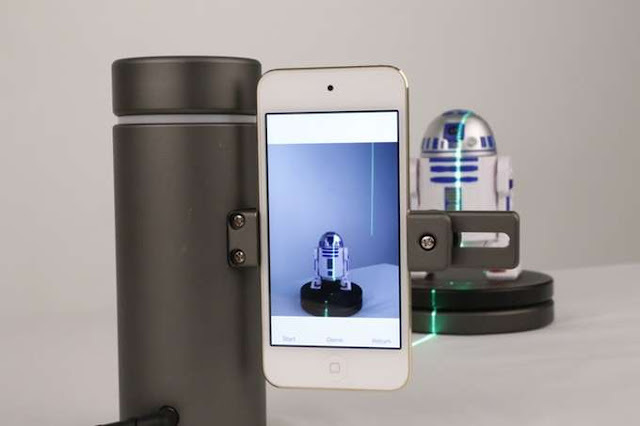 The eora 3D scanner is designed to work as an add-on for iPhones and Android—the smartphone powers the scanner— and is now up on Kickstarter, being offered at $229. The estimated delivery is June. Commenting on potential interest in such an offering, 3ders.orgmade the observation that many in the making community place 3D scanners high on their wish lists. Scanners let them make 3D printable digital models in a flash and use them as part of the creative process. The people behind this device are Australian entrepreneurs Rahul Koduri, Richard Boers and Asfand Khan. They did not have to search very hard for inspiration. Needing a scanner with suitable precision, they were looking at a $20,000 price tag and they decided that was ridiculous. They wanted to find out if they could build an iPhone-powered 3D scanner on their own for far less, said. Rahul Koduri, eora 3D cofounder, said they had found that scanners which were suitably precise cost tens of thousands of dollars, and the ones that were affordable were not, in their view, suitably precise. SlashGear commented on what they were able to achieve: "The team behind the product says that using the power and optics of a smartphone they were able to spend more money on a green laser for the scanner without pushing the price out of the affordable range." Asfand Khan, cofounder, talked about the app, where you just open it and press scanner. It can automatically adjust focus and exposure The eora 3D app is free to download from the iOS App Store and Google Play Store. A typical scan takes three to five minutes, said Khan. The Eora 3D is also compatible with Android in addition to iOS and connects via Bluetooth 4.0 .It can make scans up to a precision of sub-100 microns, which 3ders.org considers "a truly amazing" level for a portable scanner. The article assessed the most remarkable feature, the green lasers. "If you've ever seen a 3D scanner in action, you'll know that red lasers are commonly used. But digital camera CMOS sensors (like our eyes) are twice as sensitive to the green spectrum as they are to red. " The green laser, said Khan, lets you scan in any lighting conditions. The chassis is a single piece of extruded 6061 aluminium. So far things are looking good for the team. Out of an $80,000 goal they have jumped over the top with 29 days still to go and have garnered $177,519 in pledges at the time of this writing. Where do they go from here? "We've been working on developing the eora 3D Scanner for over a year," they stated. "We've tested it countless times, learned a ton, refined the design and continue to make it better. Hardware is always challenging." They said they developed many aspects of the hardware and software to ensure there are no blindspots in planning and forecasting shipping deadlines. "We are in the process of testing and manufacturing the eora 3D scanner at scale. The Kickstarter campaign helps us gauge precisely how many units we'll need to manufacture."